The archaeological site of Naḥal Re‘u’el is located in the southern Negev, c. 35 km north of Eilat. It rests on the northern bank of the wadi, near its outlet into the ‘Uvda Valley, 435 m above sea level. 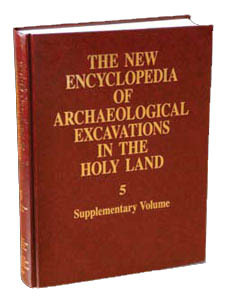 The site was excavated in 1980 and 1981 by A. Ronen on behalf of the University of Haifa, as part of a salvage project prior to the construction of the ‘Uvda Air Field. Of an estimated total area of 400 sq m, 76 sq m were excavated. The site contains a single archaeological layer attributed to the middle Pre-Pottery Neolithic B period. Three 14C measurements produced very similar results, indicating an age of 8627±45 bp (7736–7499 BCE, calibrated with 2 sigma). The excavation revealed a residential complex of circular structures arranged around a courtyard, possibly the oldest structure of the central-court type in Israel. The walls were carefully built of undressed stones, 0.6–0.8 m thick, and stand 0.5–0.9 m high. A meticulously paved rectangular basin (silo?) in locus 10 is worth noting, as is a large pit in locus 11 (2 m in diameter and 0.5 m deep) filled with ash, artifacts, and stone debris. The industry at the site was mainly centered on blade production: 75 percent of the 235 cores are naviform blade cores, and approximately 80 percent of the 810 retouched items were made on blades. Dominating the tool assemblage are arrowheads (30 percent), consisting of Jericho (53 percent), Byblos (30 percent), and Amuq points (15 percent). The point is often located off the central axis of the blank. Other major tool categories include denticulates/notches (24 percent), retouched blades (14 percent), and awls (12 percent). Sickle blades are rare and axes are absent.